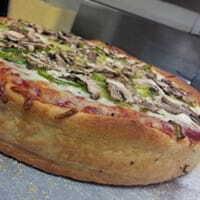 The Chicago Dough Company makes gourmet Chicago-style pizza in several varieties, we offer thin crust, double crust, a unique deep dish, and not to mention a traditional stuffed and calabrese pizzas. 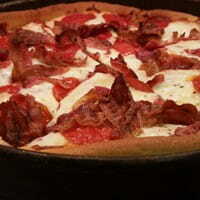 All are handmade with unbleached and unbromated dough made fresh each morning. We use only choice ingredients, cheese made to our strict requirements, a tomato sauce specially marinated with 13 different seasoning to assure maximum flavor, topped with our uniquely blended sausage and garden-fresh vegetables. 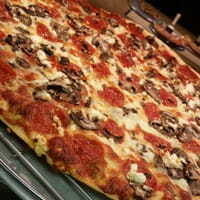 We use very little salt, healthier canola oil, and no MSG is used in our pizza. So here’s to your health! 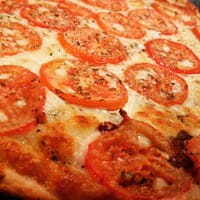 Our Pizza Buffet includes a garden fresh salad bar, large variety of pizzas, pasta, bread and soup. 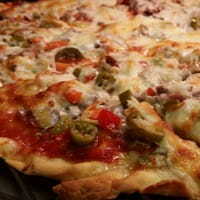 Six to nine different gourmet pizzas to choose from at any one time! Also includes all you can eat homemade soup & salad - the area’s largest salad bar featuring over 27-toppings; including fresh made salads, homemade croutons, bread sticks, pasta, real bacon, and the freshest vegetables. Top it all off with a piece of unbelievable dessert pizza. This all you can eat pizza buffet is sure to tame your appetite! Use #CHICAGODOUGH to share your pictures and posts with us.